With the Pyeongchang 2018 Winter Olympic games now behind us and the European ski season in full swing, now is the perfect time to consider where your next ski holiday should be. Whilst the Alps have everything a skier wants and needs there is a whole host of alternative ski resorts just waiting to be explored. Australia is one of only two countries in the Southern Hemisphere to have won a medal at the Winter Olympics, so it is then perhaps no surprise that despite Australia being better known for the heat of the outback, it has several well-established ski resorts, including Perisher, dubbed the “largest ski resort in the Southern hemisphere”. Clustered in the south of the country and primarily in the states of Victoria and Tasmania, the handful of resorts offer stunning scenery and runs at lower altitudes than you will find in Europe with the highest, Thredbo, climbing to just over 2000m above sea level. Our Rating: Red Run. Australia is a long way to go for a ski and the small number of resorts means visiting Australia to go skiing is not going to be for everyone. Imagine skiing in the Himalayas. Well, in India you can do just that. The resorts may be basic and small but, at almost 4000m up in the Himalayan foothills, to ski in India is something of a bucket list activity. India is a hugely varied country and the mountainous northern states are perhaps prime for further development into a winter sports wonderland on the roof of the world. Our Rating: Black Run. Small resorts tucked up high in the Himalayas will mean only the bravest and most daring of skiers will tread this path. But what a path it is – skiing in the Himalayas, what more do you want? Iran’s small ski industry has runs close to both Tehran and Tabriz making access easier than you may think for such a vast country. With runs offering nearly 2000m of elevation what the Iranian resorts lack in run numbers they make up for in run length. The largest and most established resort is Dizin, some 2500 metres up in the Alborz mountains. Our Rating: Black Run. Iran is not the easiest country to visit. Trips need careful planning but are more than worth the effort. A country rich in history and culture, a ski holiday to Iran will be something to remember. Ok, so some areas of the USA such as Vail and Aspen in Colorado are well known for their skiing. But how about skiing in Lake Tahoe, California? Or Arizona? Or perhaps skiing over sleeping grizzlies in Alaska? With over 500 resorts spanning both coasts and Alaska, you can winter holiday in America to your heart’s content. Our Rating: Green Run. With so many resorts to choose from the hardest thing may be making your decision as to which resort to go skiing! Whilst better known for sushi and ancient temples, Japan is a huge skiing nation with over 500 resorts ranging from local-use single runs to huge mega-resorts. Ski resorts can be found over much of Japan but are particularly concentrated on Hokkaido, the most northern of the main islands, and the mountainous west coast of Honshu, the main island. It is even possible to ski on the slopes of Mount Fuji. Perhaps best known of all the resorts is Niseko on Hokkaido which has grown in popularity with foreign skiers and snowboarders in recent years. Our Rating: Blue Run. Whilst skiing may not be the first thing you think of when you consider Japan as a holiday destination, its ski economy is well equipped and rivals the Alps for variety and numbers of resorts – how cool would it be to say you have skied on Mount Fuji? Photo: Skiiing at Fujiten, on the slopes of Mt Fuji. Kazakhstan’s largest city and former capital Almaty recently lost out with its bid to host the Winter Olympics and did host the 2017 Winter Universiade. So, it is fair to say that winter sports are very much on the agenda there and the locals claim that Almaty is one of the few places on earth where you can ski jump in the morning and sunbathe in the afternoon! Almaty is nestled in the Tian Shan mountains and is home to the famous outdoor ice rink of Medeu. The picturesque 6-lift resort of Shymbulak can be reached from the city via cable car and offers challenging runs at very reasonable prices. Why not bolt on a few days skiing to our Kazakhstan highlight tour? Our Rating: Blue Run. Kazakhstan feels far more off the grid than it actually is. With regular flights from Europe and very affordable prices when you are there, Kazakhstan could be that ski trip with a difference you were looking for! 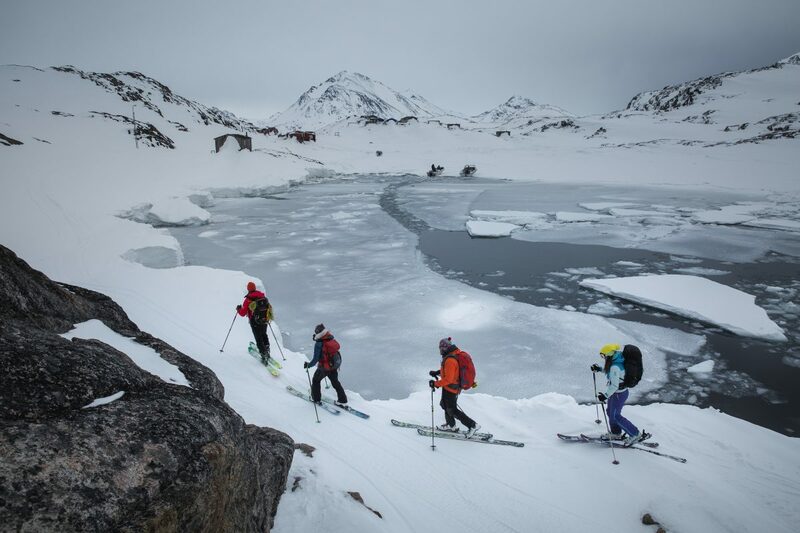 High up in the Arctic is a ski experience that is truly unique: heliskiing in Greenland. Yes, you read that correctly, heliskiing. Greenland offers a multitude of unique experiences for the winter sports enthusiast. One option is to ski untouched slopes from a helicopter, whilst ski-touring, snowshoeing and cross-country skiing offer just as unique an experience, albeit at a more leisurely pace. With intimate hotels or homestays waiting for you after a hard day skiing, Greenland and its unspoilt ice sheets and snow-covered mountains offer a ski experience like no other. Our Rating: Red Run. Halfway between Iceland and Canada, Greenland is flown over by many, visited by few. It is a destination waiting for you to explore, and perhaps nowhere is better to explore on skis than Greenland is. OK, so we’re cheating here. Dubai is like the Vegas of the Middle East – luxurious, brash, opulent, and at times utterly ridiculous! Ski Dubai is no exception to the latter – an indoor ski resort featuring 22,500 square meters of indoor ski area inside a shopping mall, in the desert. Our Rating: Green Run. Direct flights from 5 UK cities make this an easy long-haul destination, but skiing in a big fridge in the middle of the desert will give you the carbon footprint of a yeti! « Victoria Falls: Africa’s Greatest Wonder?